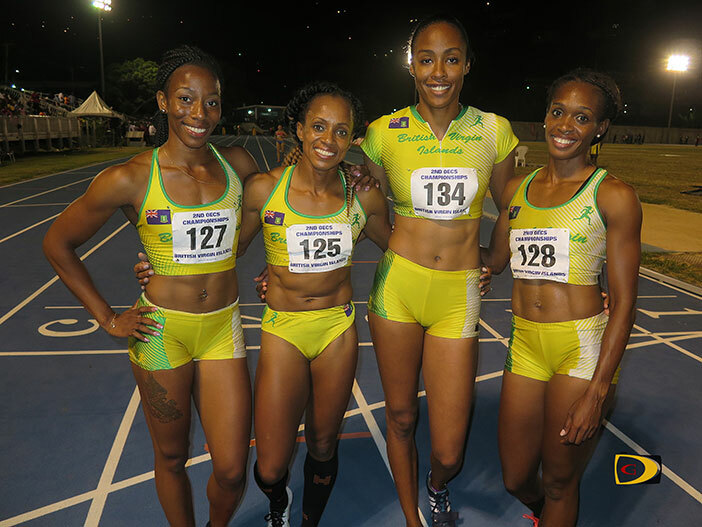 BVI 4x100m Relay quartet of Ashley Kelly, Tahesia Harrigan-Scott, Chanel Malone and Karene King broke St. Kitts-Nevis’ OECS record of 43.53 seconds with a run of 43.45 seconds. Hosts BVI, on the strength of its women’s team, won the 2nd OECS Track and Field Championships on Sunday night in a close battle with St. Kitts-Nevis and Grenada at the A. O. Shirley Grounds. The BVI amassed 183 points to claim the title. St. Kitts-Nevis edged Grenada by a point for second place—176-175. The BVI was also the top team in the Women’s Division with 129 points, followed by Grenada with 81 and St. Lucia who earned 58. St. Kitts-Nevis garnered 139 points for the Men’s Division top honors. Grenada followed with 94 and St. Vincent and the Grenadines gained 84 for third place. In all, over the two days of competition, 22 Championships Records and 19 All Comers Records were established. Three BVI National Records were broken in the process. Ashley Kelly broke Chantel Malone’s 400m record of 52.35 seconds from 2010, in winning the event in 52.29. Tynelle Gumbs upped her own Discus Throw National Record to 47.51m and the 4x100m relay quartet of Kelly, Tahesia Harrigan-Scott, Malone and Karene King, came up .02 short of beating Puerto Rico who ran 43.43 seconds in their quest to qualify for Rio, while the BVI finished in 43.45—the first time under 44.00. The mark erased St. Kitts-Nevis’ 2009 time of 43.53 seconds as the OECS Record. Harrigan-Scott capped off a sprint double when she took down teammate Karene King’s 200m mark of 23.76 seconds from 2014, with her 23.30 run, after winning the 100m in 11.25 seconds. In the Men’s equivalent, after false starting in the 100m where he was favored to win, St. Kitts-Nevis’ Antoine Adams dropped a 20.38 seconds time on the board in the 200m, to shatter his countryman B.J. Lawrence’s 20.59 mark from 2014. Adams’ time was also an All Comers Record eclipsing Jamaica’s Jermaine Brown’s two-year old 20.46 seconds mark. Eric Alejandro of non OECS member Puerto Rico, met his goal of booking his ticket to the Rio Olympic Games in the 400m Hurdles, when he smashed the All Comers Record of 51.85 seconds, with his 49.16 time. The BVI’s Kyron Master who finished second, established the Championships Record of 51.02. Marbeq Edgar engaged in an enthralling 1500m battle with St. Vincent and the Grenadine’s Delhonni Nicol-Samuel who was seeking to collect a second title after winning the 5000m on Saturday night. When St. Kitts-Nevis’ Masai Jeffers sought to take control on the final lap, Edgar surged and went on to victory and successfully defend his title. He improved his time of 3 minutes, 56.69 seconds from 2014, to 3:53.90. The time erased the BVI’s Greg Rhymer’s 20-year old 3:57.35 as the new All Comers Record. Edgar won the 800m in 1:50.22. The Trinidad and Tobago Women’s 4x400m Relay team entered the competition seeking to qualify for Rio and got a fight from a BVI foursome for the first three legs before the baton was dropped by the BVI anchor leg who had to retrieve it. The Trini’s went on to demolish the 20 year old All Comers Record of 3 minutes 45.12 second established by St. Kitts-Nevis, after stopping the clock at 3:33.93, but was off the mark needed for Rio. The BVI quartet of Tarika Moses, Ashley Kelly, Lakeisha Warner and L’T’Sha Fahie, became the territory’s second team to go under 3:40.00, with their 3:39.74 time, for a new Championships Record after demolishing the 3:57.77 mark established by St. Kitts-Nevis on home sold two years ago. The final record on the track came when St. Vincent and the Grenadines’ Brandon Valentine-Parris brought his team from the back and ran down Grenada’s Junior Charles in the last 50m, to break the meet and All Comers Records, with a 3 minutes 09.41 seconds time. Five records were established in field events. In the best High Jump field ever assembled in the BVI with three jumpers who had jumped over 1.90m, St. Lucia’s Levern Spencer cleared the bar at 1.90m for an All Comers Record, shattering the 1.65m mark that was set by three BVI athletes. Her teammate Albert Reynolds demolished Grenadian Emron Gibbs’ 69.40m Championships Javelin Throw Record and the 20-year old BVI All Comers Record held by another Grenadian Trevor Modeste, who threw 64.05m, with his 77.23m winner. Carifta Games Women’s Javelin Throw champion Candisha Scott of Grenada, shattered Rochelle Ehtienne’ 36.56 meet record with a heave of 50.35m also a BVI All Comers Record. Dominica’s Dillon Simon extended his Shot Put meet record from 18.18m to 18.85, also an All Comers mark that wiped out Grenada’s Paul Phillips’ 15.61 effort that had been on the books since 2000. The BVI’s Chantel Malone leapt 6.38m in the Long Jump to surpass Antigua and Barbuda’s Jenita Lewis’ 6.22 meet record from 2014. Grenada’s Kenisha Pascal, won the inaugural Veda Bruno-Victor Female Athlete of the Meet award, after winning the 800m, 1500m, 3000m then helping her 4x400m Relay to second place. Victor-Bruno was on hand to present the award. St. Lucia’s Marbeq Edgar was the recipient of the Joseph “Reds” Perreira Male Athlete of the Meet Award, after winning both the 800m and 1500m.